The Heart of America Flyfishers had an outing at Roaring River trout park in southwest Missouri. I caught trout and liked it, but that's expected, it's a trout park. I also caught some really neat fish out of the same water. I think my fellow trout anglers where suspicious of my roughfish enthusiasm but too bad, I got two new life listers out of the trip. The white sucker was in a big pool with lots of stocked trout. I dropped my smallest midge into a group and one sucked it up. 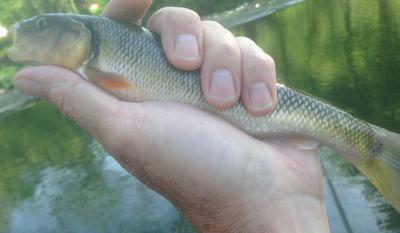 The chub was in a section of big water with many other species. I didn't know they were there till it was on the hook. I caught three stonerollers in a rapids while also catching trout on a small bead head nymph. You know you are really fishing when you don't know what you've caught till you get home and look it up. That stoneroller is a beauty. Congrats on the lifers and those are some impressive sized fish. A fish is a fish is a fish. 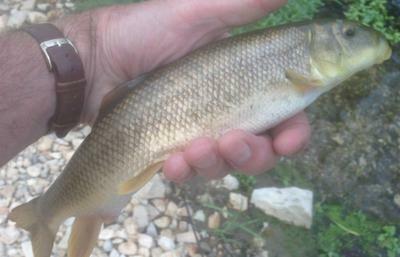 To catch one on a Tenkara rod is so much fun because you really feel the fish's fighting whether it is a chub or an 18" rainbow. The thrill of the tug! !